Pat he comes, like the catastrophe of the old comedy. My cue is villainous melancholy, with a sigh like Tom o’Bedlam. — O, these eclipses do portend these divisions. Fa, sol, la, mi. Now, without really doing any hard research except a Googling, it seems this footnote must be wrong, and I am so very eager to ascribe it to a general cluelessness about music prevalent among some theatre people… I smell a rat discussing “C major” per se in the 1604 environs … and F, G, A, E, does not outline a tritone; there are even no tritones within it. Before I burn my Arden edition in a fit of rage, are there any Shakespearians out there who can clarify this mystery? Pretty pretty please? instead of one unitary passage of time, then, there are many temporal dimensions leading us back into Bach’s fugal workshop, in which musical thinking and the relations between musical ideas and God-given principles of harmony exist in a tension with the ultimate order in which the results nominally appear. that shirt’s too cute; your friend is very thoughtful. concerning the shakespeare, i’ll write my teacher from hs. she studied at the shakespeare institute, so maybe she’ll know! How adorable, I’ve always loved Schroeder! That t shirt is perfect. So Arden doesn’t have it quite right, but I don’t know if it requires the Farenheit 451 treatment. The Lear edition I know goes no further than to assert that the notes suggest discord. That’s attractive inasmuch as it picks up beautifully on the ambiguity of “division”. But was FGAE discordant in Shakespeare’s day? Perhaps it’s the opening of some air popular among noblemen of the time but long since lost. Modern readers can hardly fail to notice, however, that the sequence rhymes with “Laramie”. music as well as you! 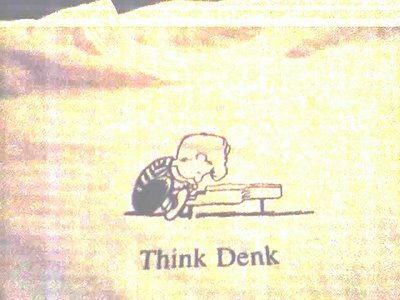 I would buy a Think Denk t-shirt. The Schroeder image must be under copyright laws though, which would keep you from using it on merchandise. Maybe someone could come up with different t-shirt or coffee cup possibilites for fans of the blog. Certainly someone could come up with a caricature of Jeremy playing the piano a la Schroeder: then the image is ‘parody’ and not in any legal violation, right? how about a light bulb over his head while playing the piano; think denk? Yeah, that would be great ’cause he’s a thinking piano man. light bulb over his head while playing the piano; think denk? I would love to buy that…. Nice blog very informative. Hope you don’t mind but i have bookmarked it. As a music theorist who’s studied this period, it IS actually a tritone, though not in the (modern) way it’s construed here. People arguing from a Guidonian, continental perspective are also a bit misled. In England, the hexachord syllables were in use, but in a different way: each note in a “scale” had only one syllable that could be attached to it (though the vice versa is not always true). And ut and re were generally or often replaced with fa and sol. Thus any half step is Mi-fa. So a C scale would be: fa sol mi fa sol la mi (fa…). So our fa sol la mi could be, say, F-G-A-B. Seems to me the scale in question was called the Landcaster sol-fa scale. It’s the same syllables one uses in shape-note singing today. A major scale is sung: fa, sol, la, fa, sol, la, mi, fa. The notes in question are numbers four through seven (a tritone). If it were up to me, I would have Edmund sing them. It would add to the spookiness of the situation (during an eclipse, which can be taken as a bad omen). We could also go on about divisions, but maybe this is enough for now. I just stumbled upon your blog while searching for some info about the same line. It immediately struck me because I sing a form of music that uses shaped notes and solfege as a tool for sight reading and our major scale goes as follows: Fa Sol La Fa Sol La Mi Fa. These syllables can signify any major scale, for example in a C-major scale the syllables would signify C D E F G A B C. I immediately though Edmund was singing the Fa that starts on the fourth (F) and the four notes following it Sol(G) La(A) Mi(B) which is a series of notes that begins on the fourth and ends of the 7th…thus that dissonant tritone/augmented fourth that is termed the “devils interval.” I don’t know a ton about music, but I believe that the tritone occurs naturally in any major scale between the 4th and the 7th notes. In the shape system I sing, those four notes in a row are ALWAYS the 4th, 5th, 6th and 7th notes. My question is related to which system in particular would have been known in Elizabethan England. My guess is that the 4-shape system I sing is probably not exactly what Shakespeare knew, but maybe…I am going to keep searching. Hope this was helpful…even though it is a few years after the original post!